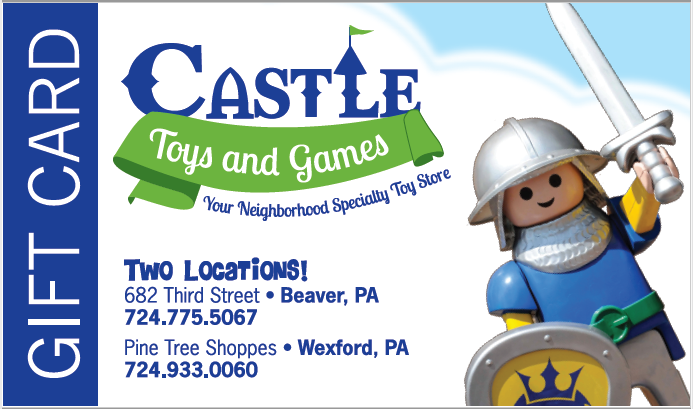 Castle Toys and Games Gift Cards can be used in our stores. If you'd like to share our products with someone who cannot come to the store, please call and we'll provide online credit for their use. Otherwise we can either mail a gift card to you or set it aside for that luck duck to pick up when they get here. Inviting your friend or family member to the store will allow them to see all of our fabulous toys and games first-hand. And because our stores are very hands-on, they'll be able to play the game or try the toy in many cases before buying. Many of our customers bring their kids and grandchildren to the store just to see what wonderful playthings they gravitate to. But for the convenience of online shopping, we've made almost all of our products available here on the CastleToysandGames.com website. And we ship throughout the US, so our Gift Cards are now a great gift idea for your out-of-town family and friends!